This is for BOTH armrest not just one as in other auctions. 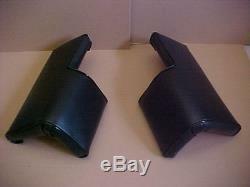 Replacemnt armrest for John Deere Crawler with the bolts and washers included. Yes you get both complete armrest with bolts and washers ready to install. Fits JOHN DEERE CRAWLER 350-450-550. Color: black and CUSTOM made in the USA. This will fit models: 350-450-550 but please see the dimension and compare to what you have. Armrest part number are #18698. 14 1/8 and are 3 1/2 inches thick, have the supplied 4 bolts on the back side. You will get exactly what you see in the picture and washers and bolts. Please note that I do not work or own any crawlers and will not be able to answer any tech questions or sell any other parts for crawlers. Comes with: All NEW MOUNTING BOLTS, NUTS AND WASHERS TO ATTACH TO YOUR crawler. The item "Armrest For JOHN DEERE Tractor Seat 350-450-550 CRAWLER, DOZER armrest" is in sale since Tuesday, July 23, 2013. This item is in the category "Business & Industrial\Heavy Equipment Parts & Accs\Antique & Vintage Equip Parts". The seller is "bakt4kids" and is located in Wauseon, Ohio. This item can be shipped worldwide.